The word “Brand” is both mis-used and mis-understood. And usually by “Brand Managers”. They’ll engage “Branding companies”. Who will devise a color palette/ logos and “Brand guidelines”. And when they’ve done that, job done. But to companies who understand their brands and what branding actually means (BMW, Volkswagen spring to mind) the act of “branding” is a constant, daily process. In my view, some of the most cohesive “brands” are people. David Bowie. Victoria Beckham. Jon Stewart. And Mohammed Ali. He, maybe, really was the greatest. He was known as “The Louisville Lip” because of his arrogance. “I’m wise to his tricks, so he must fall in round six. At first everyone laughed at him. But soon his opponents started to fall in the rounds he predicted. A man who was so supremely self-confident it wasn’t even a question of whether he’d win, just what round. Other boxers were terrified. 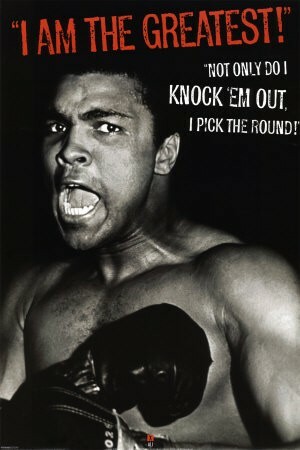 The question came to be not, would they lose, but could they survive the round Ali (then Cassius Clay) had predicted. They became so terrified of the accuracy of his predictions, defeat seemed almost inevitable. His opponents’ confidence evaporated. They were beaten and demoralized before they started. He made outrageous claims, promises. Yet he kept them. He correctly predicted (as best my limited research could find) the outcome and knock-out round # of 12 fights. I was struck, about 20 years ago in Japan, by the reputedly to-the-minute accuracy of “Bullet” Trains. The train stopped at the precise place on the platform it was meant to (the painted letter “C” on the platform would exactly line up with the door to carriage “C’ as the train came to a halt) and the train, scheduled to arrived at 9.00, would stop just as the second hand of large station clock marked the hour. Not just minute-perfect, but second-perfect. The train took exactly 3 hours to get from Tokyo to Osaka. Every day. Every trip. No one could recall a time when the train wasn’t absolutely on time. And Mohammed Ali started his career fighting opponents he could have probably dismissed in round 1 or 2. But he wanted make himself stand out. To make himself seem different. Mystical even. So he waited, and kept the fight going, until the round he predicted. Because he knew it would have a greater effect on the better fighters who were watching. The ones he’d have to fight next. I thus “knew” Ali would win. I “know” the Bullet train will be on time. I know my VW will start. Because I believe it. And I’ve had it “proven” to me. Everything the “brand” does is consistent, constant. Your brand is not what you say. It’s what you do. Previous PostFolks, “social media” is not the answer. A “great idea” is, and always has been, the answer.